This time last year, Tom Petty was in debt to the unhappy tune of about half a million dollars. A protracted legal battle with his record company, he says, almost finished him -- mentally and financially. 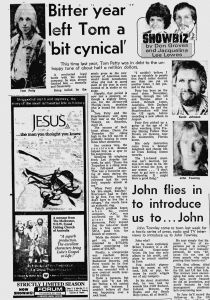 Being hailed by the music press as the new saviour of American rock wasn't much consolation when he had to spend most of the year in court instead of in studio or on stage. Happily, that period is now just a memory, although a slightly bitter one, for the 28-year-old Florida-born musician who is bound for Australia. Tom Petty and the Heartbreakers wil open their tour at the Capitol Theatre on Saturday, April 26. The success of their latest album, Damn the Torpedos (its riding high in the US top-10) is probably helping to erase those bitter memories. In a curious way, the courtroom dramas helped him as a spur to his songwriting. Speaking by telephone from Los Angeles last week, he said, "Damn the Torpedoes is a slang term for full-speed ahead. That was a favorite saying of mine during the legal troubles because everyone had his own little torpedo aimed at me." When Petty sings in his hit single, Refugee, "Everybody's had to fight to be free, You see you don't have to live like a refugee," the words have an authentic ring. 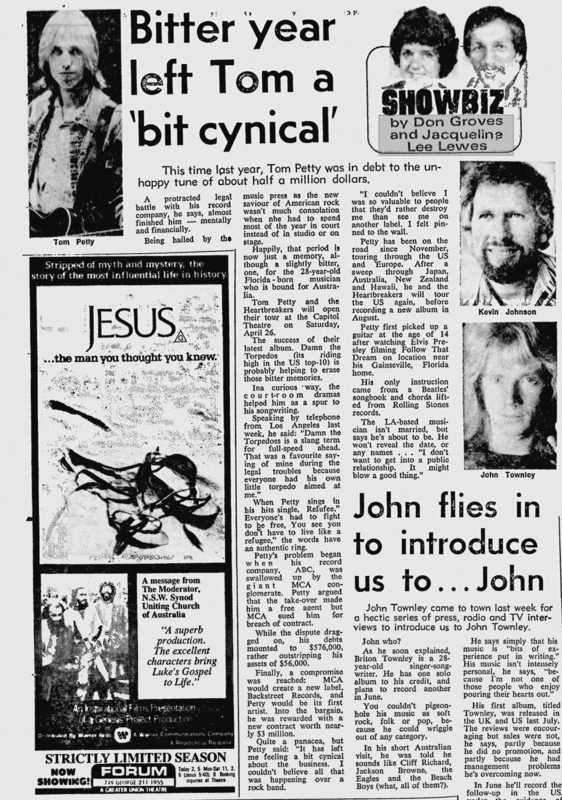 Petty's problem began when his record company, ABC, was swallowed up by the giant MCA conglomerate. Petty argued that the take-over made him a free agent but MCA sued him for breach of contract. While the dispute dragged on, his debts mounted to $576,000, rather outstripping his assets of $56,000. Finally, a compromise was reached: MCA would create a new label, Backstreet Records, and Petty would be its first aritst. Into the bargain, he was rewarded with a new contract worth nearly $3 million. Quite a panacea, but Petty said: "It has left me feeling a bit cynical about the business. I couldn't believe all that was happening over a rock band. "I couldn't believe I was so valuable to people that they'd rather destroy me that see me on another label. I felt pinned to the wall." Petty has been on the road since November, touring through the U.S. and Europe. After a sweep through Japan, Australia, New Zealand and Hawaii, he and the Heartbreakers will tour the U.S. again, before recording a new album in August. Petty first picked up a guitar at the age of 14 after watching Elvis Presley filming Follow That Dream on location near his Gainesville, Floria home. His only instruction came from a Beatles' songbook and chords lifted from Rolling Stones records. The LA-based musician isn't married, but says he's about to be. He won't reveal the date, or any names ... "I don't want to get into a public relationship. It might blow a good thing."